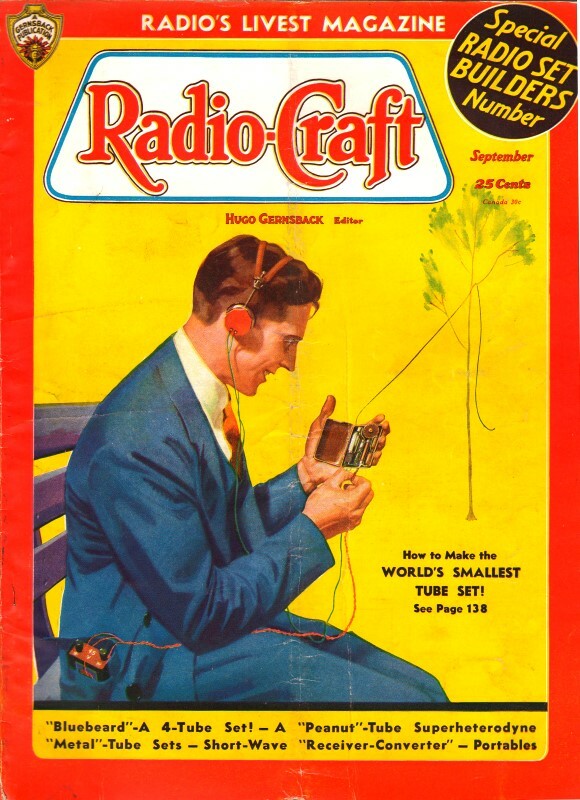 Strike three for the trio of radio models featured in this September 1935 issue of Radio-Craft magazine. I could not find any instance of the Stromberg-Carlson Model 82, either. The model 82 was a wooden-case console (floor-standing) format. It featured dual antennas that were selected automatically with the band selection control. See Tom Bavis' AudioPhool.com website for an extensive collection of Stromberg-Carlson photos, datasheets and Sam's Photofacts files. 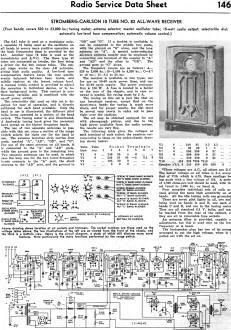 The 6A7 tube is used as a modulator only, a separate 76 being used as the oscillator on all bands to secure more positive operation on the high frequencies than is provided by the 6A7. Another type 76 tube is used as the demodulator and A.V.C. The three type 42 tubes are connected as triodes, the first being a driver for the two output tubes. The output stage works on the class AB principle, giving high audio quality. A low-level tone compensation feature keeps the tone quality evenly balanced between bass, treble, and middle register at the lowest volume level. A manual treble control is provided to adjust the reception to individual desires, or to reduce background noise. This control is continuously variable. and is combined with the on-off power switch. The selector lite dial used on this set is designed for ease of operation, and is directly calibrated for each band available.' Only the band in use is illuminated, the different pilot bulbs being operated by a section of the band switch. The tuning meter is also illuminated. A dual-ratio tuning knob gives the necessary band spread on the higher frequency bands. The use of two separate antennas is possible with this set, since a section of the range switch selects the right one for the band in use. The antenna terminal strip carries four posts, marked "A", "AD", "GD", and "G". For use of the same antenna on all bands, it is connected to the "AU" and "AD" posts, while the ground goes to the remaining two. Two separate antennas can be used. 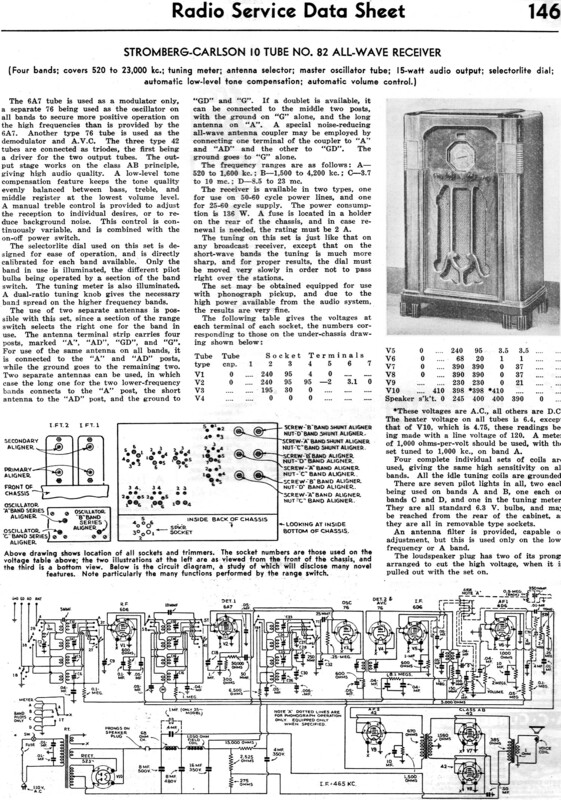 in which case the long one for the two lower-frequency bands connects to the "A" post, the short antenna to the "AD" post.